THE WRITING BUDDHA - Opinions | Books | Movies: Freedom from the I by Shashank Kasliwal (Book Review- 4.75*/5) !!! 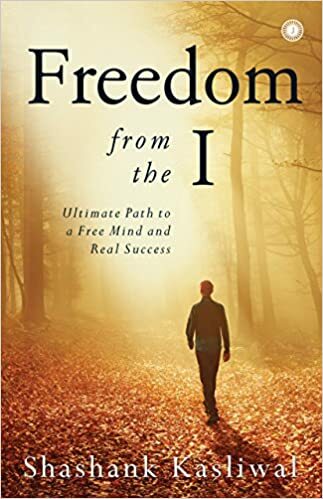 Freedom from the I by Shashank Kasliwal (Book Review- 4.75*/5) !!! There are some books which hold you like a traveler who does not have any destination to go and is here only to enjoy the journey and the newness he finds in every new second at a new spot of this world. You feel like experiencing some book rather than finishing them off and picking up the next one. It took me complete one month to finish reading a 218-pages book written by a debutante, Shashank Kasliwal, named “Freedom from the I”. The book also has the tagline “Ultimate Path to a Free Mind and Real Success”. This is yet another gem from Jaico Publication. This is one such book if you read in peace and silence can bring out several transforming changes in you and the way you think and see things. I can feel the change in my whole outlook within this one month itself. I have been a great fan of Sadhguru’s books and videos where he explains about this factor of diminishing the ego and identification that we have and lead a life which is as it is. I never believed that someone could write or explain this concept in a better manner and so vastly and yet in a simple way. Shashank Kasliwal’s first attempt at writing this self-help book is a winning start. Initially, when I started reading, the first two chapters did not sound me any different than all these self-help books which keeps releasing. But since third chapter, as soon as the author gets into his zone of explaining the effect of ego and how we have lost ourselves in this dominance of ego over us just keeps surprising the readers. I felt the book remained at its best up till 8th chapter. I did not personally feel any kind of motivation reading the last 4 chapters from 9th to 12th but they are a fine closer to the book where author explains about our dull mind, affect of emotions, our relationships etc. Shashank has very finely divided the book in different chapters and even within that into different sections with each concept not going over two pages. This keeps your interest intact as you do not get strangled in too many concepts thrown at you within a paragraph. The book is not at all research-based but purely out of experience of the author which makes it more relevant while reading as you can feel the honesty and truthfulness. This book is best for professional people out there as author has given many examples on how to handle professional and corporate stress and pressure. I have also implemented many of his ideas which has begun enhancing my experience of meditation that I had started before reading this book. The book is written in a spiritual context rather than motivational context hence it needs little more attention while reading to grasp the concepts rather than mugging the points. Overall, this is one of the best books I have read in last decade for sure. I give this book 4.75 star out of 5. Recommended for every living soul out here.